Local anesthetics work by blocking afferent pain sensation. This is great because it means that the patient can be wide awake and not able to feel you reduce their fracture, sew up their gaping laceration or release their carpal tunnel. Most local anesthetics fall into two broad categories, the esters and the amides. To remember which is which, think about amIdes having an I in the prefix and esters not. Epinephrine can be added to local anesthetics to induce vasoconstriction. This reduces blood loss and prevents excess systemic spread of the anesthetic. As a result, the maximum dose and the duration of action are less without epi than with. * Some people are sensitive to the metabolite PABA that the ester class produces, however amides do not have this metabolite. 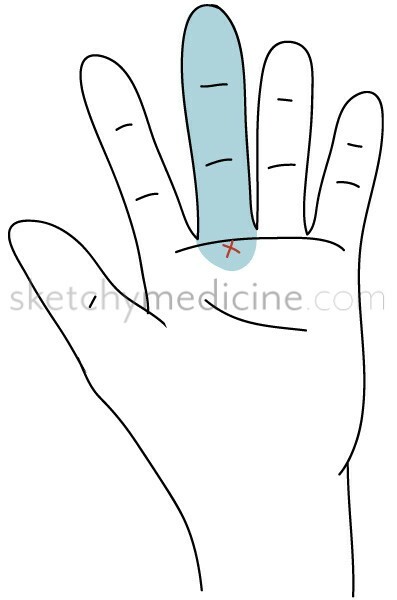 Ring blocks (aiming for the digital nerves on either side of the finger) ARE NOT necessary, you just increase the likelihood that you’re going to injure one with the needle. Instead do a single poke on the volar aspect of the MCP joint, perpendicular to the skin and inject 2-3 cc. The freezing should go in without much resistance, too much means that the needle is either in the dermis or in the flexor tendon sheath. 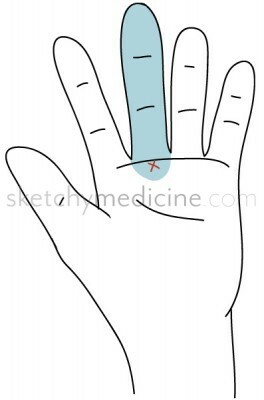 This should freeze the entire volar aspect of the finger and roughly to from the tip to the DIP joint on the dorsum. If you need the entire finger frozen (e.g. for a reduction), you can also inject 1-2 cc on the dorsal MCP. The smaller the needle, the less pain is caused by the freezing (which is acidic and stings more than you’d think). Adding 1 cc of bicarb for every 10cc of lidocaine also helps reduce pain, making you a nice person. This entry was posted in Drugs, Emergency, Plastics and tagged Anesthesia by Ali. Bookmark the permalink.